Carrollwood Players has been very busy over the last few months! We’ve streamlined, scrubbed and organized! If you haven’t been here in a while, then you should come by and see how much work we’ve done to improve the appearance of our lobby. There is excitement in the air as we look to the future! But we aren’t even close to finished yet! We are converting our former storage area to a new “black box” inspired performance space for special monthly events, including improv weekends, staged readings, musical revues and even some alternative theater selections. Spring is a time for new beginnings and growth, and Carrollwood Players has its sights set high! What we need more than anything is a nice, new place to live. The Board of Directors and Fundraising Committee have set some very specific goals for our future, and they are exciting! We have two main goals, one short term and one long term. Our short term goal is to find a nice, new temporary home in the next year or so. We estimate this move will cost at least $50,000. We have a short term goal of raising that $50,000 in the next year, so that we can move to a location that has a better appearance than our current location, and hopefully costs us less (we know it may have to be a bit smaller). You should know that paying retail rent is highly unusual for a non-profit community theater. I know it seems like we should have plenty of money based on our ticket prices, but to be perfectly honest, our operating costs are almost exactly the amount we bring in each year (if we are lucky). Our rent costs us almost 70% of what we bring in, which is high by any standard. Can you imagine if your mortgage cost you 70% of your paycheck!? You wouldn’t have much left over, and we are trying to turn that tide. So for the short term, we want to find a nice, new place to live that costs us less while we then focus on our long-term goal: constructing a new building from the ground up in a great North Tampa location. Imagine fly space, wing space for set pieces, a shop room where we can build, better dressing rooms for our actors and a gorgeous, luxurious lobby space where we can serve you with a smile. 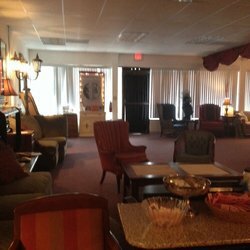 A classy place where you can be comfortable and relaxed in a beautiful theater setting. A custom built theater won’t come for free. We’ve gotten quotes and estimate that it will cost $1.5M to build a theater in North Tampa. We do not have $1.5 M dollars! Yet! So, over the next few years we are going to have fundraisers that will directly contribute to the newly created Building Fund of Carrollwood Players Theatre! Yes, this little non-profit, 501(c) 3 community theater has a goal to raise $1.5 MILLION dollars! Our next fundraiser is a very special one. We are honored to be a part of Give Day Tampa Bay this year. Every day we are taking steps to make positive changes at Carrollwood Players Theatre. Every day is a new chance to make it better for our community, and we are working hard to make it happen! We are excited and motivated to create the bright future that CWP deserves, and will make a reality! We hope you will join us on this amazing journey! We are Springing Forward full force and hope you will join us!